Talis Jayme is hosting a Children's Summer Art Workshop on June 28th and June 30th (10:00am-12:00pm). 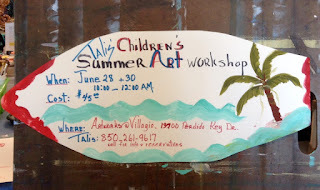 This is a great mid-day creative learning time for kids and conveniently located right across from the beach and in the same shopping complex as the Jellyfish for a quick lunch afterwards. Call Talis at (850) 261-9617 for information and reservations. 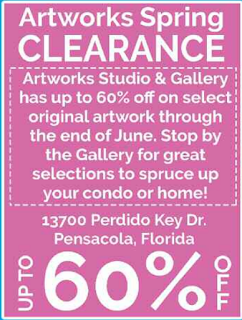 Through the end of June, Artworks Studio & Gallery has up to 60% off on select original works of art for our annual Summer Clearance Sale. 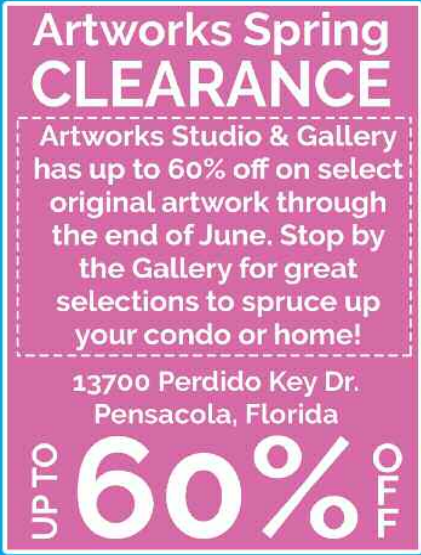 Stop by to see new works of art from our gallery of local artists and jewelers. See amazing pieces by April DeLatte, Gove Scrivenor, Cathy Deal, Maureen Turner, our very own Talis Jayme and many others. Pass along the good news to your friends and family on Facebook or offline, too. Have a great summer and stop by to see us as soon as you get a chance.